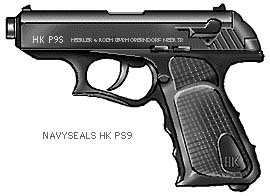 The P9S is the single action variant of the P9. It was available in 9mm and .45 ACP as well as an insert with the Europe 7.65mm x 21.5 caliber in Italy. (Italy and a few other European countries uses proprietary calibers so that Army or Police ammo is worthless.) The Sport variant included the regular slide and grips as well as the Target Sport Grip, slide and comp.